At the Ministri, we have a standard dining policy as described below. Under no circumstances do we deviate from the same. 1. We serve 100% halal meat only. 2. Government taxes are applicable on the final bill. 3. We levy a 5 percent Service Charge on the bill. 4. All items are subject to availability. 5. Rights to admission are reserved with the restaurant management. 6. Children over the age of 8 years are considered as adults. 7. We use only mineral water for all cooking purposes. 8. We use separate cooking utensils for cooking vegetarian and nonvegetarian dishes. At the Grill Ministri, we levy a 5 percent service charge on the final bill amount. However, if a guest chooses to reward their server or the team for the food and service that they have received, he / she can do so in the way of cash tips or credit card. All cash and credit card tips are placed together and shared between all the staff at the end of the day. A staff representative controls tip disbursement. 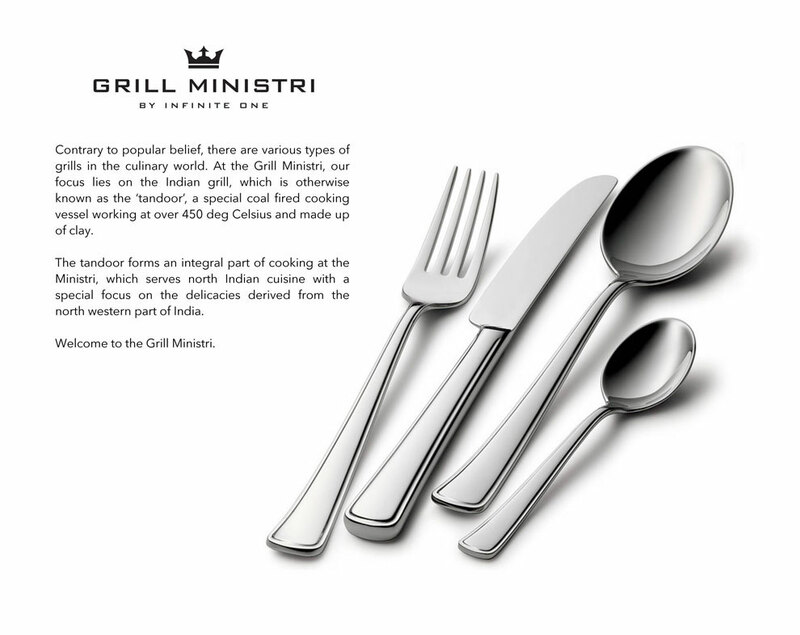 Infinite One Foods Private Limited owns the brand name ‘Grill Ministri’ and the website www.grillministri.com. Infinite One Foods Private Limited will hereby known as the ‘Company’. The materials on the Company’s web site are provided "as is". The Company makes no warranties, expressed or implied, and hereby disclaims and negates all other warranties, including without limitation, implied warranties or conditions of merchantability, fitness for a particular purpose, or noninfringement of intellectual property or other violation of rights. Further, the Company does not warrant or make any representations concerning the accuracy, likely results, or reliability of the use of the materials on its Internet web site or otherwise relating to such materials or on any sites linked to this site. In no event shall the Company or its suppliers be liable for any damages (including, without limitation, damages for loss of data or profit, or due to business interruption,) arising out of the use or inability to use the materials on the Company’s Internet site, even if the Company’s authorized representative has been notified orally or in writing of the possibility of such damage. Because some jurisdictions do not allow limitations on implied warranties, or limitations of liability for consequential or incidental damages, these limitations may not apply to you. The materials appearing on the Company’s web site could include technical, typographical, or photographic errors. The Company does not warrant that any of the materials on its web site(s) are accurate, complete, or current. The Company may make changes to the materials contained on its web site at any time without notice. The Company does not, however, make any commitment to update the materials. Any claim relating to the Company’s web site shall be governed by the laws of India and fall under the legal jurisdiction of Chennai without regard to its conflict of law provisions. This website is operated by Infinite One Foods Private Limited (“we”, “our”,“us”). 4. when you visit this site (see under Cookies below). 4. if you agree, to contact you with information about news, promotions, customer surveys, competitions, exclusive offers, events and other information we think may be of interest to you. 3. we are under a duty to disclose or share your personal information in order to comply with any legal obligation or to protect the rights, property or safety of Infinite One Foods Private Limited, our customers or others. We use a software called Google Analytics, which is a web analytics service provided by Google Inc. in order to understand how visitors to our website use the site. The Google Analytics cookies remember you from one page request to the next, for example to differentiate between 'new' and 'returning' visitors. We receive reports from Google Inc. about website usage (such as the number of visitors to our site or the number of unique page views). Google Analytics cookies do not collect personal information about you.